Figure 1: An amplifier kit needs a nice place to hang out while it amplifies (click to enlarge). On page one of this blog post, I mentioned that 10 or 20 milli-watts probably wasn’t going to cut it, at least not for regular CW (as opposed to the weak signal stuff). So, I procured an amplifier kit from the same folks who provided the “Progrock” kit, and started to assemble it. It’s nice and compact, and (hopefully) will deliver around five watts of power to the antenna when I’m done. The PA /5 watt kit comes with a heatsink that is soldered to the PCB. 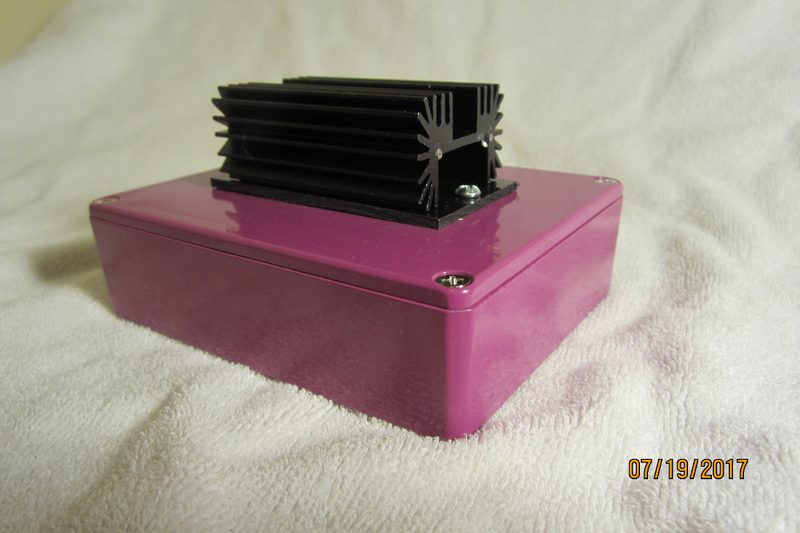 That is nice, but I wanted to put the amp into an aluminum enclosure (purple people eater colored) – and desired the benefit of ambient air circulation, rather than enclosure interior circulation. I don’t think that, at five watts, it matters that much, but hey – I could ramp up the voltage for a little more power (and set those turbo-chargers free). Figure 2: Can’t get enough of those Hammond colors! OK, so I’m getting way ahead of the game. I always do that, it seems, with my projects. The enclosure might often be the last thing thought about, but I’m making it the first thing. Why? Because I’d rather fit the circuits to the form-factor, than vice-versa. I have this idea about a pretty small, versatile QRP rig, that in a pinch could do WSPR in addition to standard CW. The folks at QRP-Labs are almost wholy immersed in the WSPR world, but mostly – I just like to ragchew, using the 30 year old bencher paddle, loafing along at 15 or 18 WPM, and having fun. Don’t get me wrong. I think the WSPR thing is great for ham radio, it delves into an area very new and very unlike the last-century’s old-time CW tech, sprouted from Marconi. Maybe I’ll get into that aspect at some point. For the time being, I’m building a CW QRP rig for old-time 2-way CW ragchews. So, I’ve decided to have separates – like in the old days, with the RX and TX in different boxes. Then, I can mix-and-match, and do some other things that are slightly better facilitated by a split design. Also – if I want just the receiver, it’s a much smaller bit to carry around. Figure 3: A crude Gimp-made block diagram drawing of the “separates” (click to enlarge). The block diagram in Figure 4 shows the basic game plan. 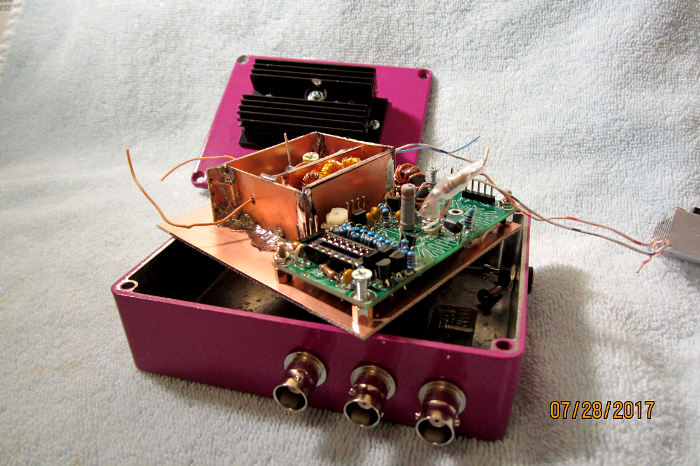 Most of the parts are available as kit boards from QRP-Labs. 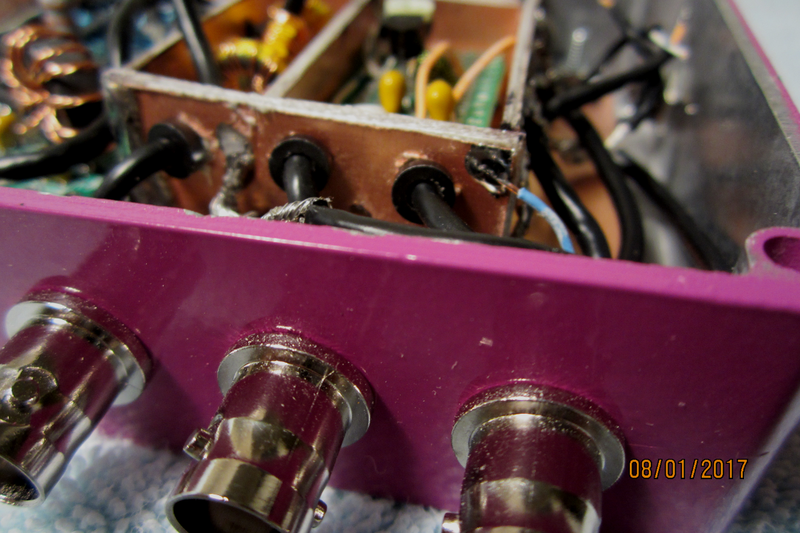 The BPFs, LPFs, Progrock, RX, and PA are all kit boards, and pretty easy to build. The only proto-board pieces are the BS-170 driver for the PA, and the TTL/RS232 converter. The rest of the job is mainly layout, (mechanical mostly) – connector installation, and a few bits of miscellaneous. I end up with five cables between the units when they are operated as a pair, and cables make me crazy. So, how to reduce? A number of cables are required for the RX-only arrangement, as well. One cable (between the units) could be dispensed with if I used a COR (carrier operated relay) for antenna TX/RX switching. Antenna switching could also be done with key/paddle initiated switching, and a short QSK time delay. But – that doesn’t get rid of the cable. So, the COR would “sense” the driver of the PA (which hopefully would not oscillate or self destruct). The V+ to the amp would not be applied, and the PA not allowed to operate unless a proper load was switched into play (otherwise, there could be oscillation and destruction of the device). Well – maybe not at five watts. But, on higher power level PA designs, this is a caveat to beware. The RX cables (from the “Pi2 powered” homemade controller tablet) make me crazy too. How to reduce? The thought occurs to me that I could use a 2.4 GHz signaling device, within both units, to eliminate all control cabling. These things are relatively inexpensive ($15 or so). 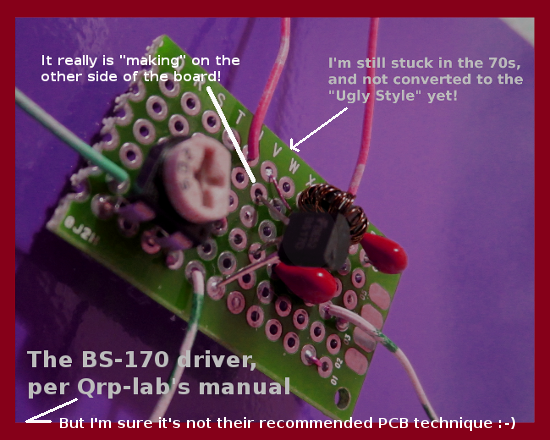 There are a slew of QRP designs out there, so why do the QRP-Labs version of QRP? Well, these folks are doing some very interesting things – things not found in most of the other “traditional” QRP kit sets. For instance, they are using a power modulator design, that can carefully control the amplitude for raised cosine shaping of the transmitted signal, to make it click free. The Progrock synthesizer that these folks provide is pretty stable frequency wise, and so there’s no chirp. The raised cosine shaping is done with a tiny MCU (Atmega) – which in included on the PA (5 watt amp) board. 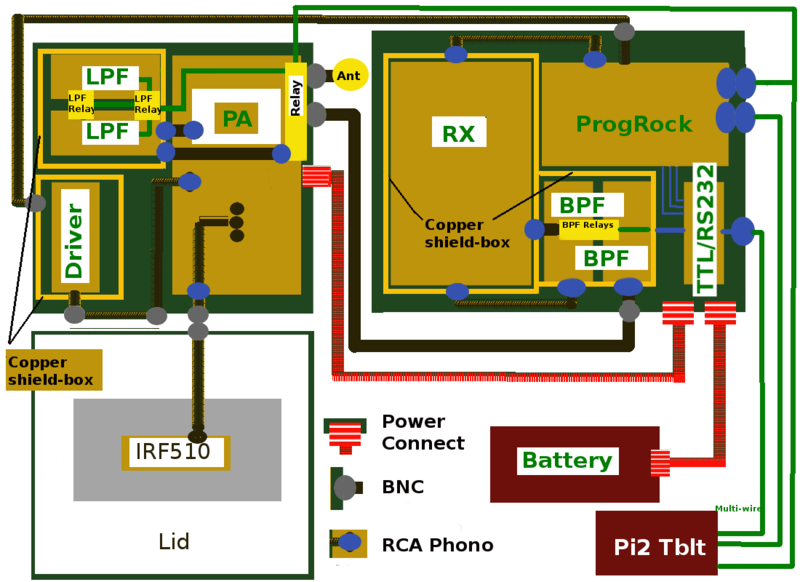 So, a simple transmitter is just a Progrock, an LPF filter, a BS-170 FET driver, and the five watt amplifier that includes the MCU for shaping. I’ve listened to the signal, and it’s beautiful. There is much to do. I’ve decided to be generous with shielding. 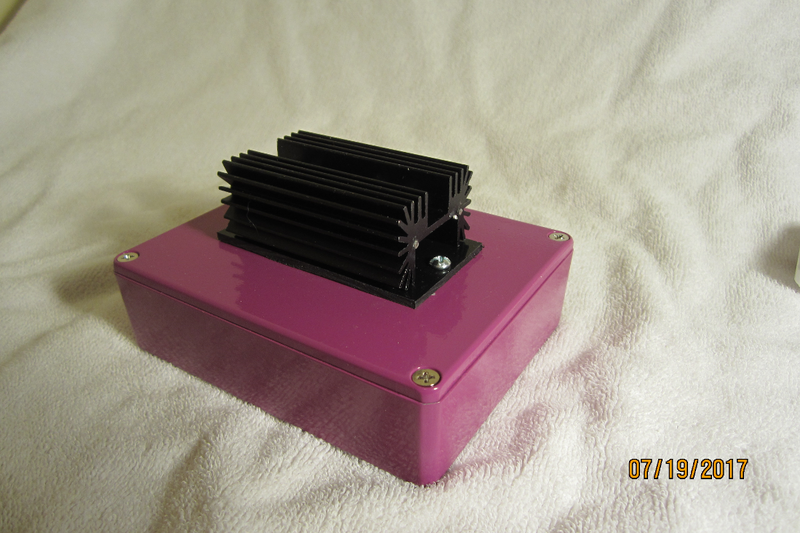 The LPFs and BPFs will be in miniature, copper-clad, homebrew shielding boxes. The transmitter driver will have a compartment also. The shielding will be just as important (probably more) in the receiver, where we’ll be trying to reduce capacitive coupling between the parts, and trying to reign-in the perfomance loss that the coupling creates. The fact that most of the RX parts are already on one board means we are beginning pretty far behind the starting line. Figure 5: Starting to connect the compartments with RG-174 coax. So, in figure 5 I’m starting to connect the shielded compartments with RG-174 mini coax. Notice the braid soldered to the cladding in a couple places. Easy – and the frays are taken care of. The corners of the clad boxes look like there could be a gap (due to the fact that the boards used for shielding are not solid copper. But, the trick when using two sided copper clad for shielding is to solder a seam along all the inside corners. That way, there’s no gap that is tough to fill. So, in the picture, there is solid metal shielding, even on the corners. The compartment lids will be thin metal sheet with folded edges. Note: QRP-Labs at https://www.qrp-labs.com is not affiliated with this site or author in any way. Note: The Raspberry Pi Foundation makes the Pi2 referenced in this post. They are not affiliated with this site or author in any way.